A Bitcoin transaction in the municipality of Zug during this past week. The private Bank Vontobel AG has introduced a new financial instrument to enable trading in the cryptocurrency bitcoin on the Swiss stock market. The bitcoin-linked tracker certificates from the Zurich-based bank will be available for regular investors starting on July 15. They allow for trading in the digital currency in traditional markets, but the process is a bit more complicated than trading in bitcoin directly over a cryptocurrency exchange. Vontobel is the first Swiss issuer to offer a tracker certificate on bitcoins for subscription. The Vontobel certificate, in US dollars, is meant to simplify investing in bitcoin, the bank said in a statement posted online. Earlier this month, the Swiss town of Zug in central Switzerland became the first in the world to begin accepting Bitcoin as payment for government services, an arrangement offered on a trial basis until the end of this year. The region around Zurich and Zug has recently become a hub for the financial technology (Fintech) sector in the country, and the self-appointed “crypto valley” of Switzerland hosts around 15 companies specialising in blockchain technology that underpins Bitcoin. 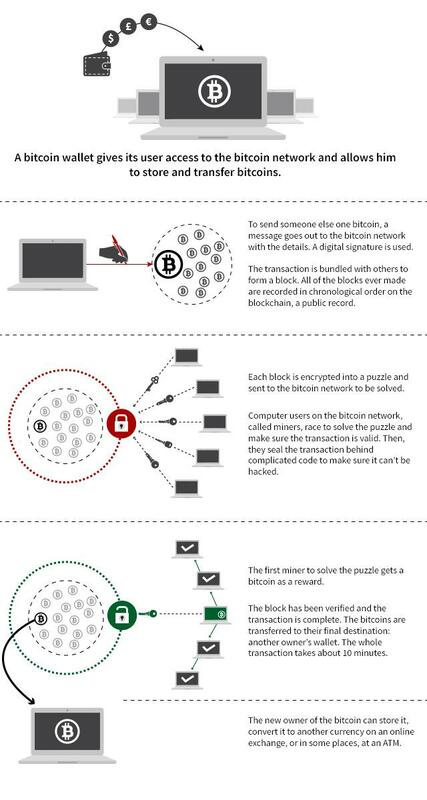 Blockchain, created in 2008, is an encrypted programme that acts as an online ledger. Each block of transactions is linked in a chain, giving an overall picture. The programme lets transactions take place between users without need for banks, or for a central clearing system like SWIFT. Blockchain can store and transact virtual currencies, such as bitcoin, or store and distribute other valuable information such as digital contracts, land deeds or internet domain addresses. Each user opens an encrypted ‘wallet’ and sends or receives bitcoin to counterparty users on the network. Swiss bank offers bitcoin trading Jul 5, 2016 - 14:53 The private Bank Vontobel AG has introduced a new financial instrument to enable trading in the cryptocurrency bitcoin on the Swiss stock market. The bitcoin-linked tracker certificates from the Zurich-based bank will be available for regular investors starting on July 15. They allow for trading in the digital currency in traditional markets, but the process is a bit more complicated than trading in bitcoin directly over a cryptocurrency exchange. Vontobel is the first Swiss issuer to offer a tracker certificate on bitcoins for subscription. The Vontobel certificate, in US dollars, is meant to simplify investing in bitcoin, the bank said in a statement posted online. "The new bitcoin certificate will for the first time give investors a simple and transparent means of investing in bitcoins on the SIX Swiss Exchange,” said Roger Studer, head of Vontobel investment banking, adding that the certificates show the bank is “one of the leading providers of structured products.” Earlier this month, the Swiss town of Zug in central Switzerland became the first in the world to begin accepting Bitcoin as payment for government services, an arrangement offered on a trial basis until the end of this year. Emerging Swiss hub The region around Zurich and Zug has recently become a hub for the financial technology (Fintech) sector in the country, and the self-appointed “crypto valley” of Switzerland hosts around 15 companies specialising in blockchain technology that underpins Bitcoin. Blockchain, created in 2008, is an encrypted programme that acts as an online ledger. Each block of transactions is linked in a chain, giving an overall picture. The programme lets transactions take place between users without need for banks, or for a central clearing system like SWIFT. Blockchain can store and transact virtual currencies, such as bitcoin, or store and distribute other valuable information such as digital contracts, land deeds or internet domain addresses. Each user opens an encrypted ‘wallet’ and sends or receives bitcoin to counterparty users on the network.